Since 15 January, Higher Education (HE) members of the University and College Union (UCU) have been voting in the pay and equality ballot. The ballot covers 143 universities and will close on 22 February. In last term’s ballots (counted university by university) on this same issue, most UCU branches failed to meet the 50% turnout requirement imposed by the Trade Union Act 2016. This time, the ballot is aggregated, so all results will be counted together. Station staff on London Underground’s Bakerloo Line South Group, which includes Oxford Circus, Piccadilly Circus, Charing Cross, Lambeth North, and Elephant and Castle, have voted by 88% for strikes against short-staffing. Tube union RMT has announced strikes for 26 December and 14 January. Security staff at the University of Leicester are currently in dispute with management, who wish to cut their working week to 35 from 37 hours, with the loss of two hours’ pay. Effectively this works out to be about £800 per year. A large sum for relatively low paid workers but a tiny sum for the university, especially when the team they are targeting is very small. GMB and Unison picket lines covered Glasgow on Tuesday 23 and Wednesday 24 October in a two-day strike by City Council employees. A lunchtime demonstration on the first day of the strike also saw four thousand people march through Glasgow to a rally in front of the City Chambers. Further Education (FE) college workers are holding a national week of action from 15-19 October. 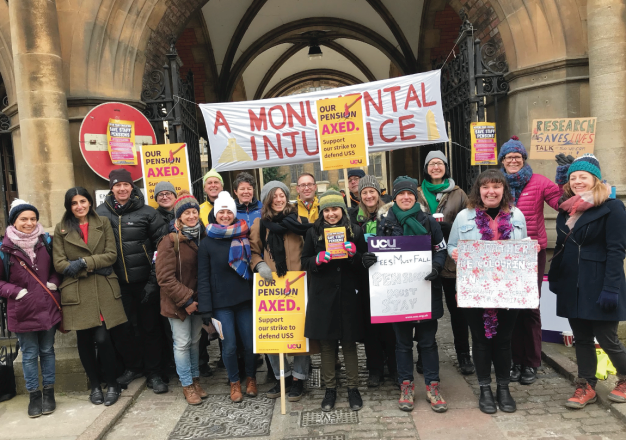 The week of action over FE funding involves the FE lecturers′ union the UCU, plus other unions including Unison, Unite, GMB, NEU, NUS, TUC, and ASCL. 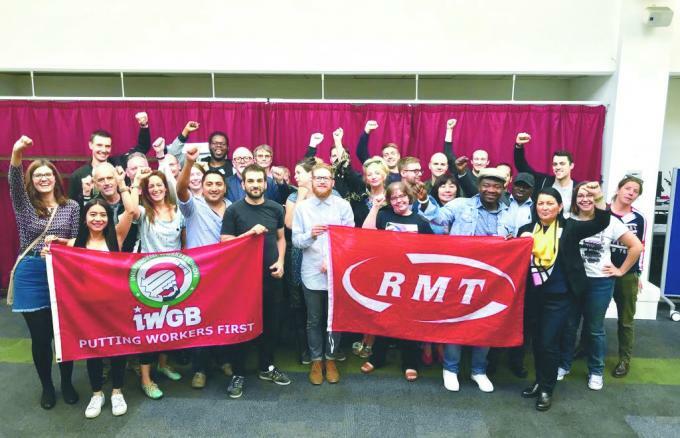 Activists from the Independent Workers’ union of Great Britain (IWGB), United Voices of the World (UVW), UCU, Unite, RMT, Bectu, and other unions and workers’ organisations came together for the “How To Win At Work” conference on Saturday 18 August, hosted by the left-wing think tank New Economics Foundation. On 29 June, UCU confirmed that, between August and October this year, it will ballot HE members for industrial action over pay. This follows a consultative members’ ballot on whether to accept the 2% pay rise offered by the Universities and Colleges’ Employers Association (UCEA). On a 47.7% turnout, 82% of UCU members rejected the offer and 65% said they would be prepared to take industrial action. 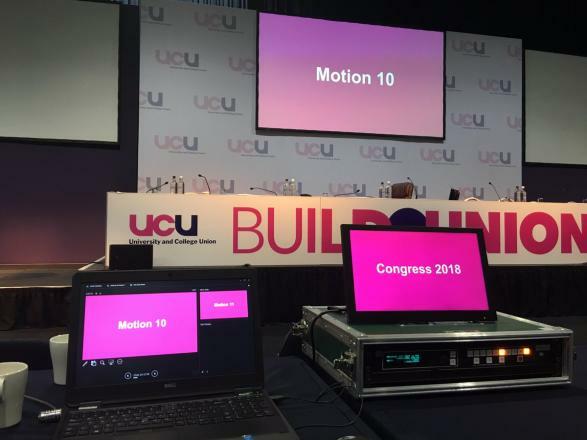 The congress of the University and College Union (UCU) on 30 May to 1 June was repeatedly shut down by officials to prevent discussion of motions criticising the General Secretary, Sally Hunt. The 14 days of strikes this year to defend USS pensions in 65 universities, and a coordinated wave of local campaigns in further education colleges, have boosted union membership and pushed forward a new generation of activists. We should welcome the opportunities Labour’s mooted National Education Service (NES) presents to transform education. One area that especially deserves attention is postgraduate and early career research. Graduate teaching assistants, hourly paid tutors, and other precarious education workers would benefit immediately from Labour’s policy commitments on workplace rights, including their commitments to repeal the 2016 Trade Union Act and to ban zero hours contracts. Read more about Post-grads as workers? Comment by a Workers' Liberty UCU member on UCU Congress can be read here. Jo Grady, UCU activist and Lecturer in Employment Relations at the University of Sheffield, spoke to Solidarity about the USS dispute, UCU Congress and where next? Solidarity: Where are things with USS at the moment?